In her book The Three-Day Feast, Gail Ramshaw opened my eyes to look in a new way at the marvelous stories of our faith that are used in the Easter Vigil (which is my all-time favorite service of the year). She points out that each of the 12 stories (yes, I did say 12) teaches of God’s power of resurrection; each presents an image of God; each offers a metaphor for baptism. The story part of the service starts at the very beginning (a very good place to start). Genesis 1:1-2:2 are one of the two creation stories of the Bible. This one was written later in the history of Israel – thought to be during the Exile which was a time of both despair and hope. As you read it, think about what hope it might carry for those in anguish. Note: The second story is thought to have been written around the time of the United Kingdom of David and/or Solomon. Also note: Walter Brueggemann’s maintained in his commentary on Genesis that these creation stories are neither history nor myth. They are proclamations by God’s people about God’s decisive action in all of life. Genesis 1:1-2:2 points to the total giftedness of Life. Earlier translations talk about God’s Spirit “brooding” over the waters of Chaos. I love the deliberate feel of “brood”. God is mulling, ruminating, pondering the possibilities. It is also not lost on me that “brood” is also used to describe children/offspring. As a one who grew up on the farm, my first understanding of the word “brooding” related to a hen caring for its chicks or the warmed building in which we cared for the chicks (brooder house). There it is – a connection to baptism. God’s Spirit continues to brood over the waters of fonts and rivers and pools of our baptisms, making each one a Child of God, filling each one with God’s own creative Spirit. That word “Spirit” in Hebrew can also mean wind, or breath. 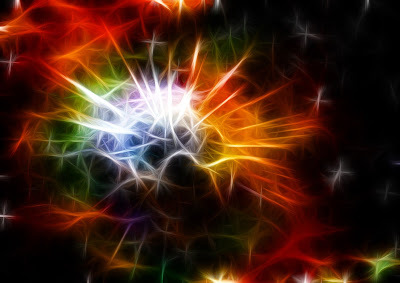 God’s life force is about to stir things up. God speaks and all has begun. And God starts with Light that bursts through darkness to create time and place - and new life out of no life. What image of God do you get from this story? I can imagine an artist who is so full of creativity that s/he cannot help but create; I can imagine an orderly engineer who lays out the way to get from here (chaos) to there (creation); I can imagine a Parent so full of love that every act is filled to the brim with it. As I was preparing for this year’s Vigil, I found a coloring book on a blog* of a Catholic catechist named Katie in central Illinois that put this creation story in a framework that I had never quite perceived before. New life, new sight! 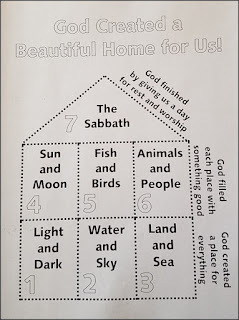 Her image for the totality of creation in this story was a beautiful home that God has built for us. The first “floor” are the first 3 days – Light/Dark; Water/Sky; Land/Sea with the caption God created a place for everything. 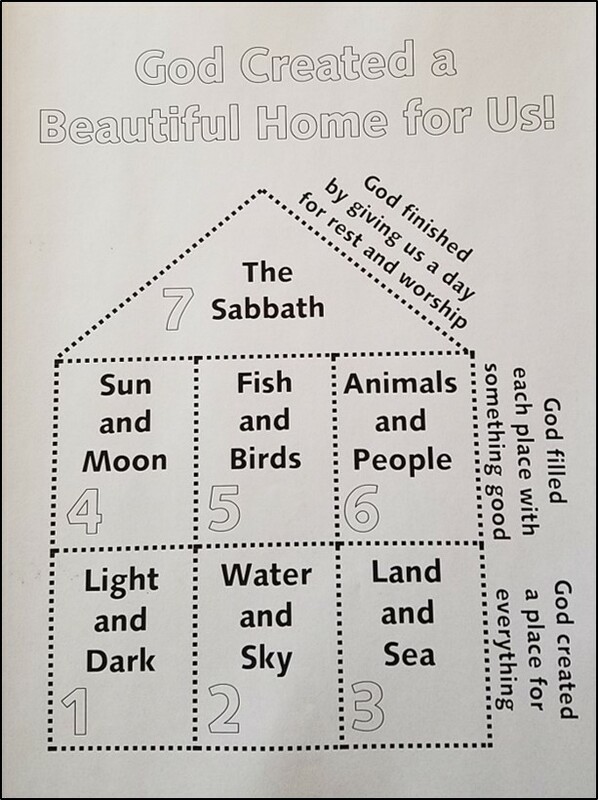 The second “floor” are the next 3 days – Sun and Moon; Water and Sky; Animals and People with the caption God filled each place with something good. What image does Katie have for God? Read and enjoy this wonderful story about the God who made life. Reflect on the 3 questions Ramshaw asks of each story. What does this teach about resurrection power? What image for God does it give you? What metaphor would you claim for baptism? For these weeks of Easter I plan on looking at more stories from the Vigil. Share your questions, insights, comments below.